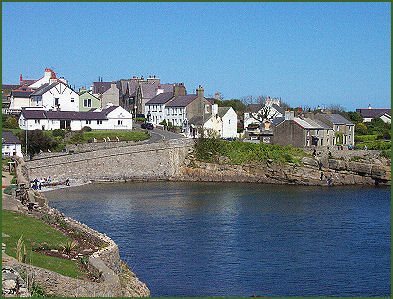 The attractive former fishing village of Moelfre is situated on the east coast of Anglesey and boasts a long maritime history. The name derives from the Welsh word for barren hill. Moelfre was the site of the tragic wreck of the ship The Royal Charter in a fierce storm. The ship was near the end of its voyage from Melbourne, Australia to Liverpool in 1859, when most of the passengers and crew, a total of over 450 people, lost their lives. Almost exactly a century later, in October 1959 another ship, the Hindlea, struck the rocks in almost the same spot in another gale. This time the outcome was different and all aboard were saved by the Moelfre lifeboat under its coxswain, Richard Evans. The wreck Of the Hindlea can still be seen on the rocks at the base of the cliffs beneath where the old coastguard look-out station used to be. Moelfre RNLI Lifeboat Station is open to the public, the first station was established in the 1830’s and to date the lifeboats have saved over 1,000 lives. Guided tours operate in summer months. Moelfre Seawatch Centre, run by the RNLI, reminds the visitor of Anglesey's rich Maritime history. Exhibits include a real twentieth century lifeboat, the Oakley Class Lifeboat "The Birds Eye", which visitors may climb aboard and the story of Coxswain Richard Evans who was awarded two gold medals for saving the lives of the crews of two ships. The centre also covers the rich marine wildlife of the area. 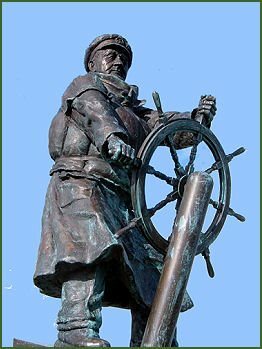 An imposing sculpture of Dic (Richard) Evans, the hero of the wreck of the Hindlea, cast in bronze and standing 14 feet high, now stands by the Seawatch Centre. Moelfre has large sandy beach Traeth Lligwy, which is very popular with windsurfers and other windpowered watersport enthusiasts. The nearby Din Lligwy hut circle is an ancient settlement, The well preserved remains may date back to the Iron Age and was probably a small farming community, archaeological evidence suggests it was occupied up to the Romano-British period. Several of the hut walls still survive to a height of around six feet (2 metres), and an entrance is visible on the north-east side of the enclosure. The houses, stone walls and defences consist of limestone slabs, standing up straight on their edges. Excavations on the site revealed that the round structures were probably houses and the rectangular ones barns or workshops. The ruined chapel of Capel Lligwy or Hen Capel Lligwy (Old Lligwy Chapel) as it is sometimes known, stands adjacent to the path that leads to the Din Lligwy hut circle. The church dates back to the twelfth century, when the Viking raids on Anglesey ceased, which lead to increased stability and prosperity on the island. The Church of St Gallgo's is situated on the south west outskirts of the village. The church is dedicated to Saint Gallgo and is one of the oldest Christian sites in Anglesey. The chancel and transepts, which are the oldest features of the present building, date from the late 15th century, but there has been a church on the site since the 6th or early 7th century. Many of the victims of the wreck of the Royal Charter lie buried in the churchyard. Moelfre Island or Ynys Moelfre, separated from the mainland by a shallow channel named Y Swnt or The Strait or The Sound, is a haven for birdlife, including gulls, terns, gannets, fulmars, cormorants, shags and Great/Arctic skuas. Seals, harbour porpoises and dolphins may also be sighted. The Anglesey Coastal Path, a panoramic 200-kilometre (124 mile) long distance footpath which follows nearly the entire coastline of the island, runs by the village..